May 2014 – Multisport coaching. 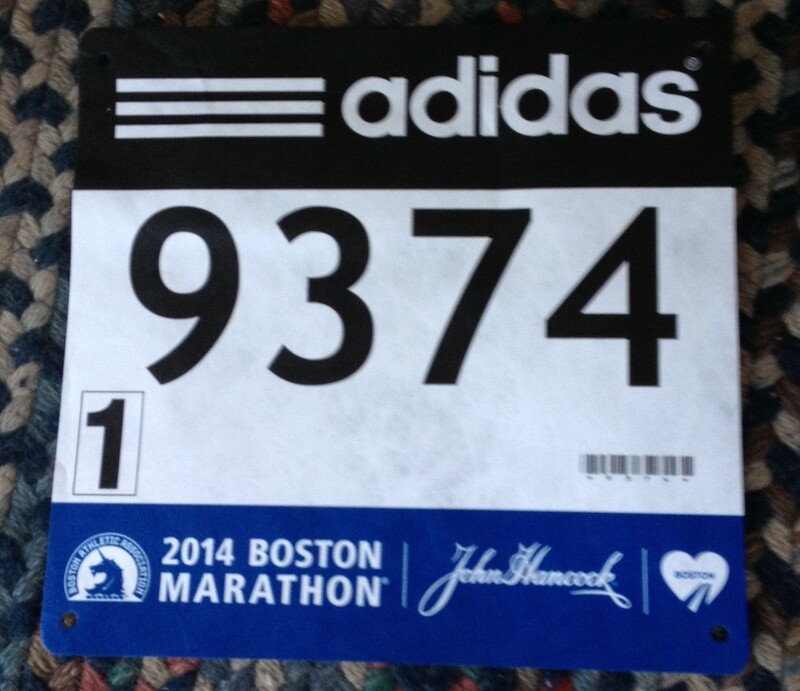 On April 21, 2014 I ran in the Boston Marathon. A lot of you probably know the story of my journey to get to the starting line. 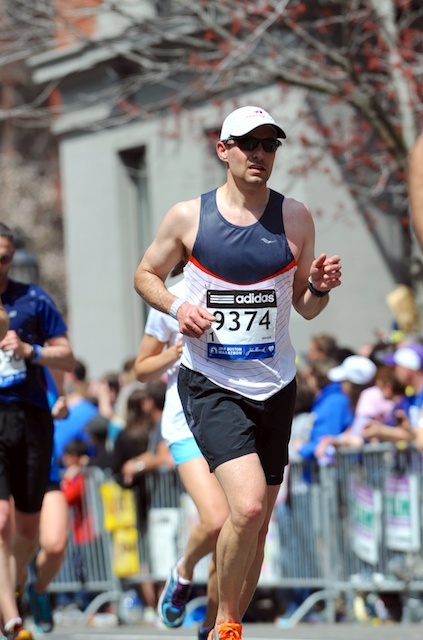 I ran under the necessary qualifying time for my age (3:14:59) at the Chicago Marathon in 2012 (3:13:53). 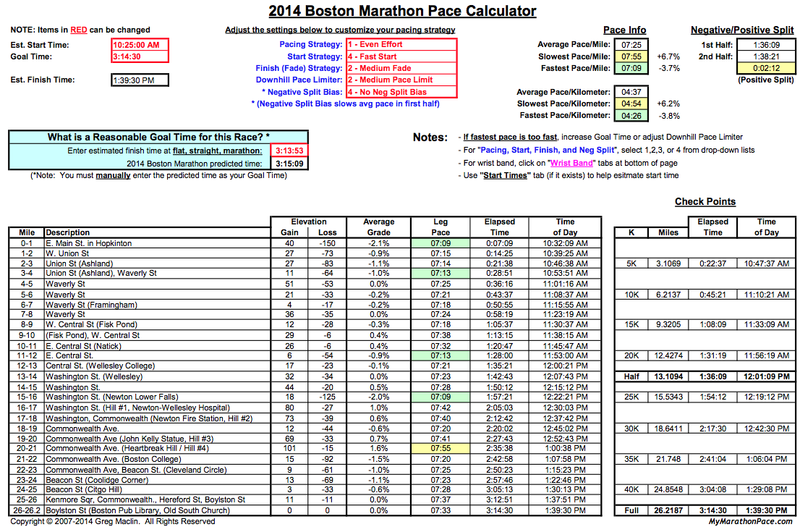 Then after the bombing at Boston in 2013, the demand to attend the race shot through the roof, and my qualifying time ended up being 31 seconds short. It was only the second time in history that not every qualifier was allowed into the race. It was a bummer. I tried to find a way to get in, but had pretty much given up hope and started training for the Illinois Marathon instead, which was to be run 4/26/14. Then two things happened. The first was a contest on Facebook sponsored by PowerBar, where they asked runners to tell them why running Boston meant so much to them. Facebook users then voted for the 10 best stories, and then PowerBar selected the top 4 to get race entries. My story, which was about how I took up running after my Chilean mountaineering trip/injury, and how I wanted to use running Boston to teach my twin girls perseverance, got me into the final 10 but not the final 4…so no entry. But then the second thing happened. 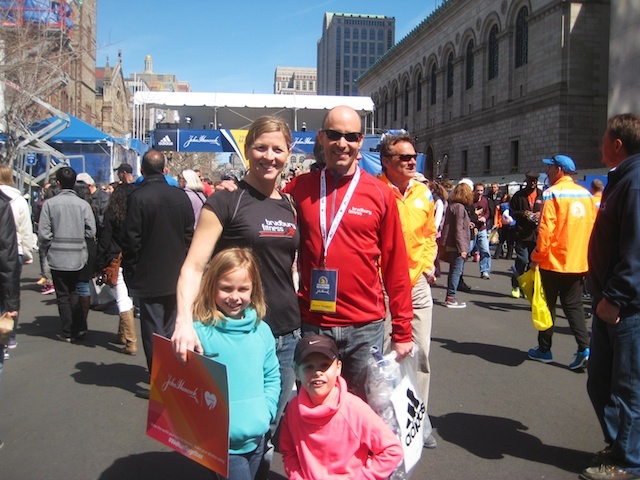 A friend of a friend heard about my story on Facebook, and they in turn relayed that story to the Brassard family, who had been injured in the 2013 bombings, and had free race entries to give away. 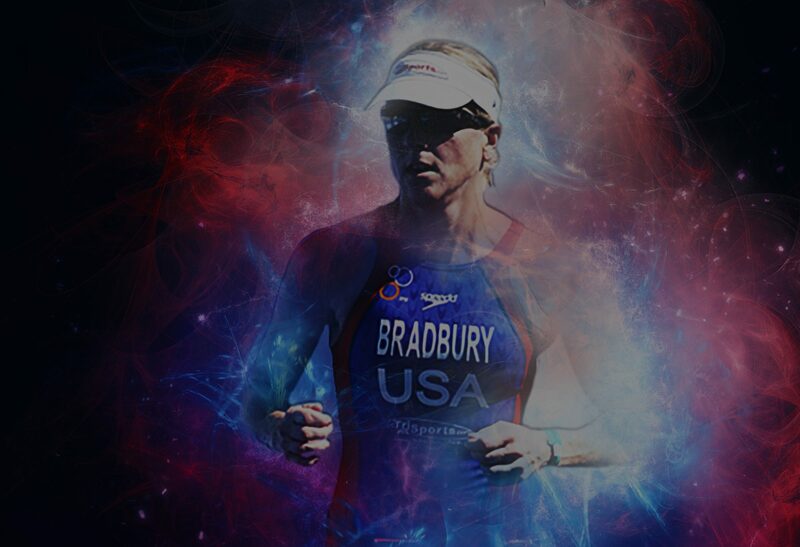 They reached out to me in January to offer a race spot to me, no strings attached…and voila…dreams really do come true! All things considered, as in, Chicago’s record setting crappy winter weather considered, my training went very well. I’ll run outside in the cold and snow and darkness no matter what, and I managed to get in about 95% of my training volume although there were a few I had to slow down my tempo, speed, or race pace intervals due to safety and average. Regardless, I still managed about 45 miles a week or so January straight through to April. In spite of that, come March, I was not that sure where my fitness stood. I raced the Chicago Shamrock Shuffle 8k and soon found the answer: my fitness was excellent. I PR’ed that distance by over 2 minutes and ran a pace just a few seconds off my 5k personal best. All systems go! We headed out to Boston on Friday night before the race. 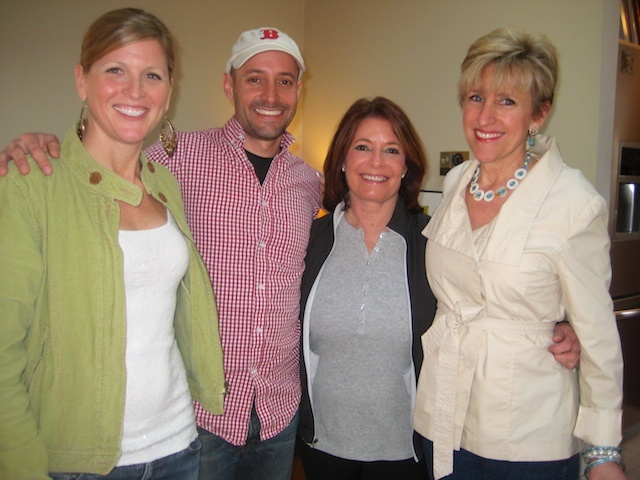 It was a family affair…Mary and the twins were all tagging along to cheer me on. The girls got a big thrill on the flight on out as the pilots invited them into the cockpit when we were boarding. They got to sit in the seats and push some buttons…you’d think they had died and gone to heaven. We ended up staying on the first floor of an old Victorian home 3-flat in Jamaica Plain just outside the city. It was another friend of a friend setup and it turned out to be a phenomenal situation. The occupants upstairs invited us for waffles Saturday morning, and even gifted the girls with surprise Easter baskets on Sunday morning – placed discretely outside our door. Awesome! Saturday Mary and I went to a Red Sox game at Fenway while the twins did the duck boat tour (they loved it!!!) with my mom. Saturday night my aunt and her friend hosted a pizza party for us out in Newton. My aunt Sudi lived in Boston for over 30 years, although she now lives in Santa Barbara, so she was back to see me race and re-connect with old friends so she had quite the soiree put together. Sunday I did short run around Jamaica Pond with Mary, and then we did packet pickup and cruised the expo – although it was crazy/stupid crowded, and involved way more standing around and waiting than I would have liked. I did pickup a pair of Saucony Kinvara 5 running shoes, hot off the presses, and a new race singlet. 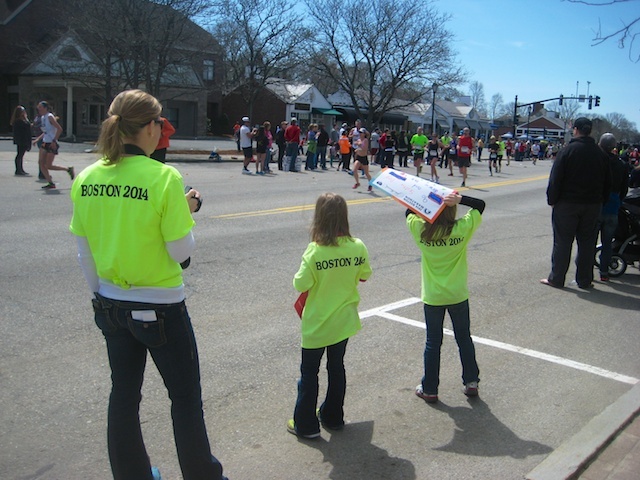 We walked to the finish line area and took some pictures, and got to see first-hand the bombing spots along Boylston. We met my friend Mark and his wife for a late lunch – I was in marching band in high school and U of I with Mark – he now lives in Arizona but was also there running. Sunday night we did quiet pasta dinner at home with just Mary and the kids, and then I drove over to Wellesley to stay with my friend Bruce Noxon at his brother’s house. 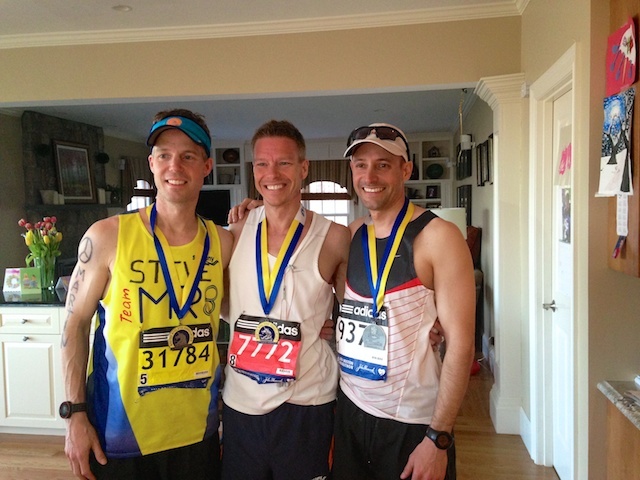 Bruce and his brother Stephen were both running in the race – Stephen has been instrumental in the MR8 charity campaign to commemorate Boston bombing victim Michael Richard. I slept good…felt good – onto race day! One of the nicest parts of this race is that the first wave does not go off until 10am – so no scrambling around at 5am to get to the race start. We downed some banans, bagels, and peanut butter for breakfast and slapped on some sunscreen. Bruce’s father, Woody, drove Bruce and I to the start area in Hopkinton – about a 20 minute drive or so from Wellseley. You can’t drive right to the start line…you either take a bus from Boston, or take a bus from a staging area just outside Hopkinton. We did the latter obviously, and arrived in Hopkinton about an hour or so before the start. Security was tight…we got searched a couple of times and there was a law enforcement agent every 10 feet in Hopkinton. At the start you spend most of your time in a huge staging area at the local school called the Athlete’s Village. They have huge tents setup outside, food, drinks, and a million porta-potties. They stage the waves and corrals from there and it is about a 10 minute walk back into town to the start line area. I mostly just sat around…Bruce was in the first wave, so he took off pretty quickly. I was in the first corral of the second wave…so my start time was 10:25am. With 45 minutes to go I downed my 16ounces of Generation UCAN – it’s a supplement I can’t recommend enough…for either long distance running or triathlons. Meb Keflezighi uses it, and used it that day for a victory in the race, and it has been rock solid for me throughout my training. No GI issues, and lots of fuel in the tank. With 30 minutes to go they started releasing the 2nd wave to get to the start. I did a last porta potty stop on the way, and then strolled up to Corral #1. It was nice to be in the first corral of this wave – you get a clear road ahead of you, and get to actually see the start line area up close and personal like you see it on TV. It’s a really small town, and a small 2-lane road, and in-person it all looks even smaller. There were 9000 people in my wave spread out in 8 corrals – but it did not feel cramped. I stripped off my extra clothing, fired up the Garmin, and waited for the gun. I remember feeling very calm. A lot of my pre-race nerves come from just the unknowns of getting there, being healthy, trying not to forget anything…standing there counting down to the gun I felt clear and focused in mind and body. I was done at my race weight, fit, and ready to go! The gun goes off, and it’s go time. The first miles are mostly downhill – the first mile in particular feels straight down – it has an average negative grade of 2.1%. 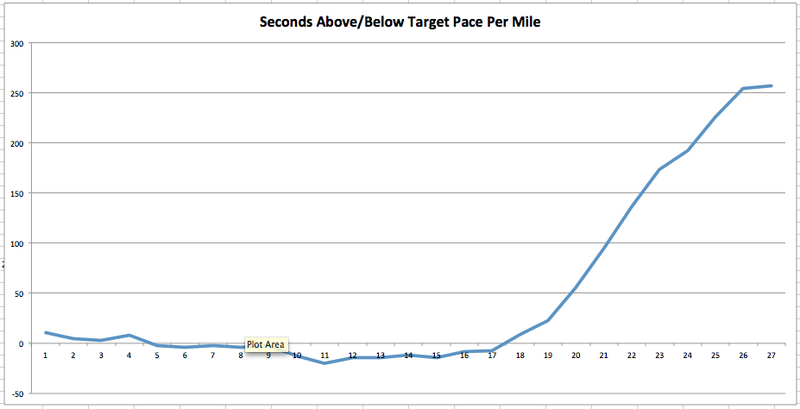 Here is a look at the overall course elevation profile. The first few miles were fast, but with all the downhill, I was supposed to take them fast – controlled and easy fast. Mission accomplished. I felt good. I was hydrating with both the on-course Gatorade and water, holding my pace back in a manageable zone, and feeling good. I wasn’t sure where I would see Mary and the girls, so I kept to the right-hand side of the road as planned and kept an eye out. It turns out I missed them at mile 7 or so. I was carrying 3 gels with me and dropped one at mile 8 but just kept going. I only planned to actually take 1 or 2 during the race so I was okay there and if I managed to lose my remaining stash there was a gel station later in the race I could use to replenish. Weather-wise it was beautiful for spectating, but a little warm for running. Start-time temp was in the low 60’s and it hung in the mid-60’s the whole race, and mostly sunny. This would come into play later when I started to get worn down and a little de-hydrated. The highlight of the first half, and maybe the whole race for me, is the stretch at mile 12 to 13 going by Wellesley College. The road is packed with screaming girls. Lots of ‘Kiss Me’ signs. It is LOUD. It is the first time in the race that the crowd is that much of a factor – and it carries on that way from there almost all the way to the finish. This video gives you some idea. Through halfway and I was right on track, and in fact about 15 seconds ahead of my target pace. At this point I was still only 20 seconds off my goal…but I could tell it was over…at least in terms of getting a 3:15. My energy level was dropping, the sun and heat were zapping me a little, and my legs were fried. 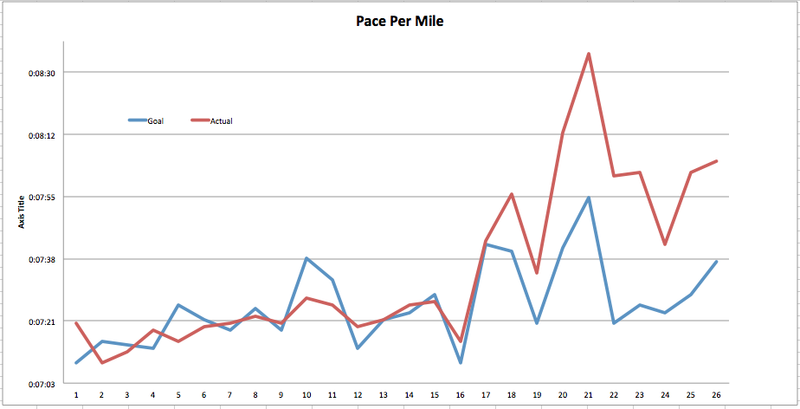 I forced down a gel to keep the calories coming in, and moved on to the last 2 hills at miles 20 and 21. The last hill is the famous Heartbreak Hill I had promised Mary that I would not walk up the hills – and I kept that promise, but I did have to walk for a few seconds twice more on the downhills. At this point I’m just trying to hold it together. The last 10k was mostly a blur. I heard some “Scottie Dog” cheers at Kenmore Square, I remember seeing the Citgo sign, and praying for it to be closer (you actually see it from pretty far away and then it disappears for a while before you see it again when you are right up on it – talk about frustrating…it’s like a mirage in the desert! ), and I remember the little underpass on Commonwealth before the turn onto Hereford where it seemed like people were walking everywhere. I had this vision in my head that had stuck there for months of making that final left-hand turn onto Boylston and seeing the mile 26 sign and the finish line and running past the bombing spots and being overcome with emotion at the depth and significance of that moment to me and to everyone else running the race in honor and tribute of all that happened last year. There was none of that. I was simply exhausted and dying for it all to be over. My legs were screaming, my feet hurt, and all I wanted to do was lie down somewhere and drink a 2-liter of Coke. Ohh but wait…first grab a medal, and get a picture. But that is racing for you. 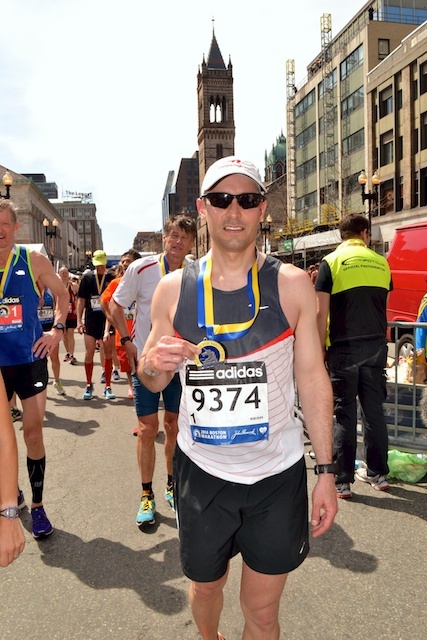 I went there to race the Boston Marathon, and not just do a victory lap, and I gave it my best. It was my fourth marathon, my second fastest at 3:18:49, but the one were I buried myself deeper than I ever had before. There is nothing unusual about my race from the standpoint that I blew up where almost everyone does – right at the Newton Hills. I’m actually pretty proud of the fact I hung in there and held it together somewhat all the way to the end. The last 4 miles felt like an eternity. I did also improve my seed time by almost 3000 spots…from 9374 to 6141…meaning I finished 3000 people ahead of my qualifying time. Not bad! The crowds were amazing – you almost become numb to it after a while with all the screaming and all the support you get from the throngs lining the course 5 deep. After the finish, I wandered over to an apartment nearby on Pembroke, where a friend of Sudi’s lived, and where racers and spectator alike slowly filtered in. I was the first to arrive and must have looked like death warmed over. I went right to the fridge and got that 2-liter of Coke out. Sweet Jesus it tasted good. Bruce arrived soon thereafter, and my mom and Mary and the kids, too. We walked through our war stories from the race and ate and drink and mostly sat and hobbled around for a bit before heading back out to drop Bruce off at his brother’s place in Wellesley, where we met up with all of this family and told our stories all over again. 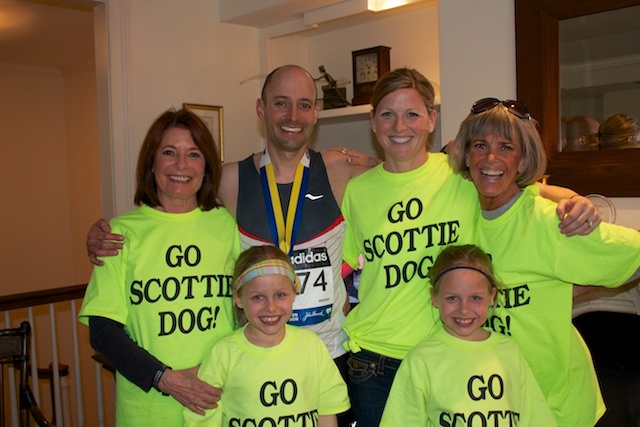 Bruce is a client of ours and ran a very brave race – finishing in 3:04 – a marathon PR for him by over 5 minutes. He was aiming to go under 3 hours which was a bit ambitious for him but he hit the wall just where I did at the 35k mark. Overall he has dropped over 30 minutes from his marathon in just about 2 years time and I know on his next one we will get him under 3 hours. That’s Bradbury Fitness for ya! Finally get to wear the jacket! On the flight home I put on my finishers jacket for the first time – superstitiously I don’t like wearing it before the race ( and I don’t understand people who do). 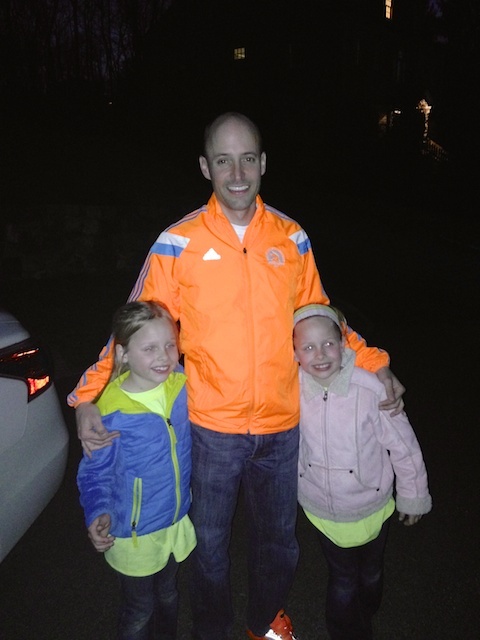 It was great to see the airport swarming with those orange jackets (Adidas does a different color/design each year). What an experience, and what an honor to be there and race this year. It was wonderful to be there racing with friends, in front of lots of other friends and family. It’s the Super Bowl of marathon running – and I hope to make it back some day to do it all over again!! 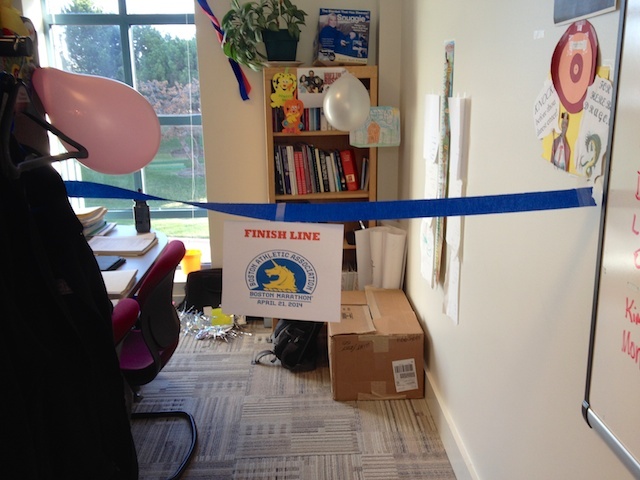 When I got back to work after the race my staff had made me another mini finish line to cross. It was hilarious! They got a kick out of following me and supporting me virtually during the race. Back at AAP…another finish line to cross to get to my desk! And finally, here is a link to some more pictures on my flickr account.